All of the wild ideas do come across as scattered and unrelated, though. The film plays out more as a series of episodes than a single story arc. 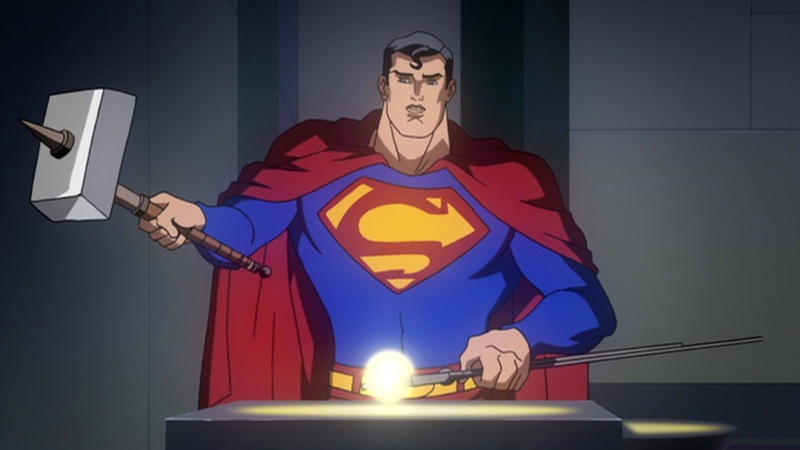 Superman does a lot of weird stuff like creating miniature stars to feed his pet sun-eater, making a potion that gives Lois superpowers for a day, and solving the unsolvable riddle of the sphinx. Oh wait, I mean the ULTRA-SPHINX. ‘Cuz that’s so much cooler than a regular sphinx. But the plot has more cohesion than it first appears. All of those things come back into play for the grand finale. I would argue the ultra-sphinx’s riddle to be more important than the others. 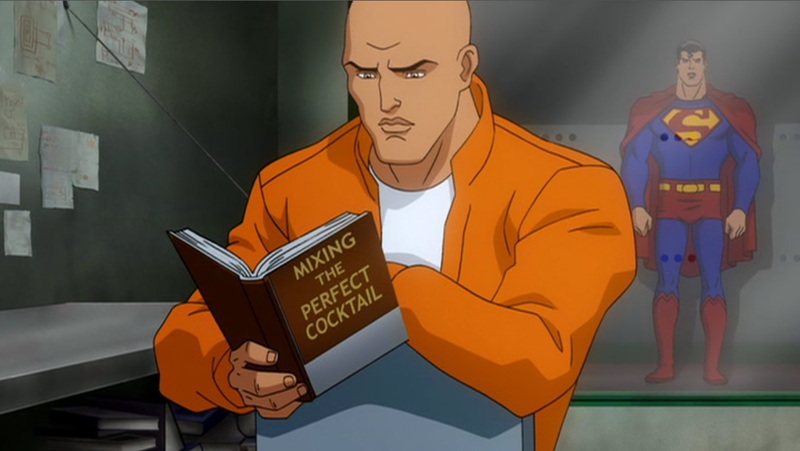 Superman’s answer is not just some random side-story. I think it reflects the final climax of the film, and Superman’s relationship with Lex Luthor. There’s a lot more thought going into these events than is immediately apparent. Even the title itself is more appropriate to the plot than at first glance. Stars, the sun in specific, tie into the plot in a big way. At the beginning of the film, Superman gets a little too close to the sun and absorbs too much energy. It makes him even more powerful than before, but that power is more than he can handle, and his cells start to self-destruct from all that energy. Superman is dying. The film is less an action/adventure tale than it is a character study of the Man of Steel in his final days. That character is one of calm acceptance. In fact, Supes is not very concerned about much of anything. The dude is as chill as his own ice-breath. Even when some Kryptonians show up and break the moon, his reaction doesn’t have much emotion. I can understand that when it’s almost impossible to hurt a guy, he might stop worrying about stuff, but I couldn’t help thinking they took it a bit too far. Especially since the plot is a rather scattered collection of events. The combination winds up making the film go about as fast as water flows uphill. There’s a lot to entertain, but there doesn’t seem to be any connecting thread until the end, and even that connection requires some contemplation. You’ll spend most of your time wondering where the hell this film is going. 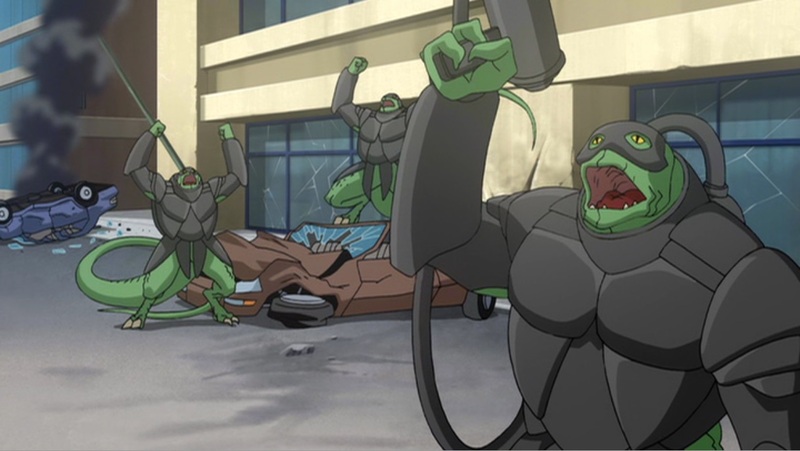 As with most other animated DC films, All Star Superman bolsters up the action scenes, taking what might be a page or two in the comic and extending it into an elaborate action piece. Usually this is good. You need to use the strengths of your medium to their fullest, and the extra excitement is very necessary for such a meandering film as this. But one of the scenes — when Parasite goes on a rampage — turns into another flaw. Mainly because Superman himself is standing on the sidelines. Come on Supes, stop dithering around pretending to be Clark Kent and get a move on! Parasite is sucking the life out of people. Do something! This time the extra action made Superman’s laid back attitude seem like complete disinterest. So the film does have a few problems. I still had a good time with it, though. People who want a modern, no-nonsense, non-camp superhero action film are going to be very disappointed, but if you are a fan of the bygone era of comic books that were all about pure, unrestricted fun, then there’s a lot to love about this movie, even if it does stumble a few times along the way. Besides, it’s not like those old comics never stumbled either. So take Superman’s attitude. Just sit back, let it roll on by, and enjoy the fun for what it is. Also, the correct answer to the Ultra-Sphinx’s riddle is that the two cannot exist in the same universe. If there is one, there cannot be the other. I found that the ridiculousness of the events did lend more to parody than to serious story, I found myself laughing out loud many times during the runtime, especially the random joke of Olsen’s outfit. Yeah, Olsen was always good for a laugh here. I think people tend to take this one more seriously than they ought to. OH MY GOD. Are there comic fans that don’t like stuff like this? I didn’t think it was possible to sell me on these animated DC movies (because they don’t appeal to me visually at all), but these things you list sound INCREDIBLE! I love a good realistic superhero tale, but I think Superman lends himself well to the real over-the-top stuff. Y’know, the closer we get to Man of Steel, the more disappointed I think I’m going to be. I’ve tried not to see anything since the first trailer last year, but I have a suspicion that this Superman won’t be as fun and grand. We’ll see. Sadly there are. This receives more hate than the other DC films. Looking at the Amazon reviews, most of the other Superman movies have a very top heavy distribution, with lots of five star, a bunch of four star, a few three star and only a couple bad reviews. This one has a much more even distribution, though. Maybe it’s the times we live in. People want a believable story these days, even from their superheroes. I haven’t been paying too much attention to Man of Steel either. Since DC seems to be trying out the Marvel integrated franchise concept, I hope it’s good, but I’m not going to bet on it. Low expectations mean having a better chance of being impressed, so I’m taking the cautious rout myself.